Giraffe, Elephant, Hippo and Baboon all live by the lake, happily going about their own business, until one day Giraffe spies the shadow of Lion - prowling, creeping, stalking, sneaking. What are they to do now? Cummings has given us a polished gem of a picture book story. He shows us the contented lives of Giraffe, Elephant, Hippo and Baboon, their happiness, the noises they make and the way they respect their animal neighbours without living in their pockets. That all changes the day Giraffe sees something - prowling…creeping…stalking…sneaking. Lion slinks away but the animals know he'll be back. And that's when Baboon gets an idea. Dawson's lively, illustrations are full of character. They really add to the humour of the text and the drama of each situation. Kids will particularly enjoy the giant scary shadow page! 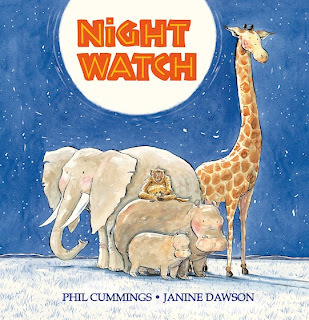 Recommended for ages 3 - 6, I think Night Watch will make a fine inclusion to a library's resource box on the theme of bullying. Kids will draw the parallel between Lion and other bullies, and rejoice when he is trounced by Baboon's plan. The book also serves as a prompt to talking to kids about shadows and shadow theatre. Night Watch makes a fun read-aloud and is a perfect choice to follow up with improvisation or reader's theatre. Sounds like this book makes the point strongly without belaboring it and becoming too dramatic. Thanks for sharing.